This flower is hanging on the front porch at my parent’s home in Moore, Oklahoma. It was there before the tornado, and it remained after the storm as well. The window directly behind this plant is shattered to pieces. The siding is obviously coated in muck and ick. But just look at this flower! What a wonderful representation of the spirit of the people of Oklahoma. . . 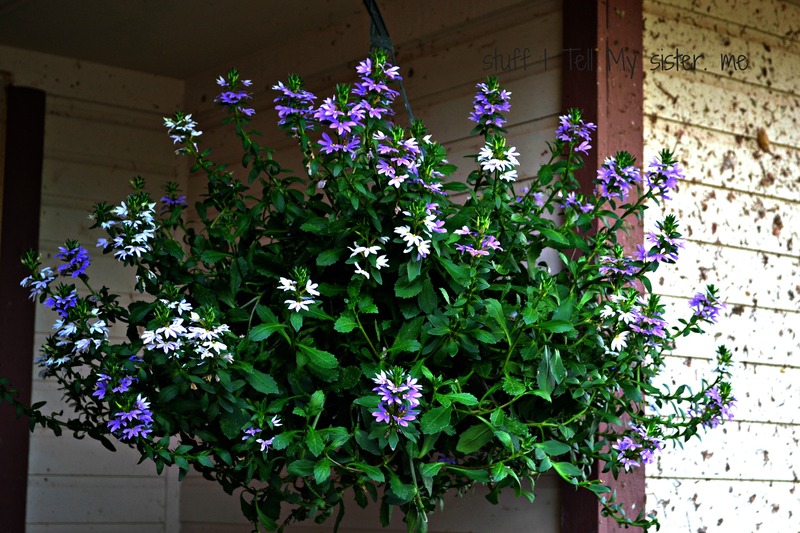 This entry was posted in Family, Flower Photos, Oklahoma, Oklahoma City, Uncategorized and tagged Bend, Broken Windows, But do not break, Hanging basket, Moore, moore oklahoma, Oklahoma strong, surviving, Survivor, The spirit of Oklahoma, tornado, Tornado flower. Bookmark the permalink. Wow. That is amazing, and the flower is so vibrant. There are life lessons to be seen in that photo, too – yielding, bouncing back, restoration. Definitely a sign of hope! A wonderful sign of endurance! Perfect way to start Monday, great post! A sign that is is not lost. It’s amazing how that happens – little pockets preserved like that. Wonderful! HAHA….We were just talking about how they do have to wash SOME Of the windows! 😉 And the siding…..and the brick…..but grateful to still have a home! That siding looks pretty bad. But you are right, having a home is pretty amazing. That reminds me of the saying “Bloom where you are planted.” I imagine this beautiful basket of blooms somehow cheers your parents. I hope they feel good thoughts & prayers coming to them from all over the country. The twists of nature are always amazing! You saw the flower as a representation of the spirit of Oklahomans but I saw it as God leaving some hope behind. By the way, what kind of flower is that?